Kevin B Browne MD PA (San Antonio) - Book Appointment Online! Welcome to SA Sinus, the office of Kevin B. Browne, M.D. 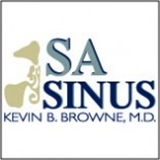 Dr. Browne specializes in providing the utmost in comprehensive sinus care for Central and South Texas. Using all of the most innovative techniques, his goal is to attend to all of your sinus needs, from medical treatment to surgical therapy. This was my first visit with Dr. Browne. He was thorough and attentive. He was engaging and listened to my issues. Top shelf! It was refreshing to be treated by an office staff who were efficient and nice. I will definitely see him again- should the need arise.